The SmartPuck inside a prosthetic device. Related: Photo gallery at end of story. The makers of an innovative device placed inside a prosthetic to provide a more secure fit and monitor internal conditions will use the $25,000 they won in a UNC competition earlier this month to start fulfilling orders. 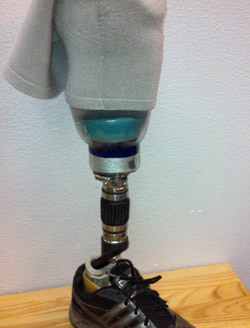 The puck-shaped insert, called the SmartPuck, produces a vacuum inside a prosthetic to connect it to the residual limb of the amputee. What's more, the device contains an onboard computer that links to a smartphone or tablet app to provide real-time feedback — such as the number of steps taken — and to allow pressure to be adjusted by the individual. For now, Vertikle Enterprises LLC/5280 Prosthetics is offering the device in below-knee prosthetics with plans to expand. 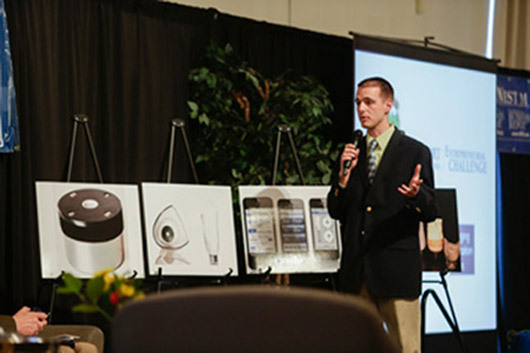 The product took first place at the fourth annual Entrepreneurial Challenge sponsored by UNC's Monfort College of Business. "The prize money will enable us to get the product manufactured and delivered to customers," says Walter Wilson, president of Vertikle Enterprises. Second place ($15,000): Grouse Malting and Roasting Company, a malting company focusing on organic, gluten-free grains for brewing and baking. Third place ($10,000): WildFit Gyms, an outdoor fitness equipment concept featuring website and mobile app integration.